A Payment Gateway service empowers merchants with the Internet equivalent of a point-of-sale (POS) terminal and software without the hassle and expense of hardware or software maintenance. It is an ideal product for the merchant who requires a PC-based solution. 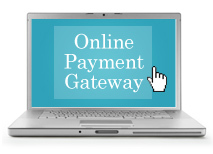 The Payment Gateway service enables merchants to process credit card transactions from any Internet-connected computer. Its innovative system processes customer orders received from a retail (face-to-face), telephone, fax, mail or e-mail transaction, then generates sales, return authorizations, and reports.